When I learned of a new Italian restaurant in Murray called Celeste Ristorante—opened about two months ago—I wondered: Could it be? The name Celeste rang a loud bell and triggered some cherished food memories. And indeed, much to my elation, Celeste Ristorante is named for a chef I've been following on and off for more than two decades. His name is Paulo Celeste. I first became aware of him back in 1994, when I enjoyed a plate of his ethereal gnocchi at a restaurant in Heber called Il Giardino. Back then, you didn't find housemade gnocchi on local restaurant menus, and you surely wouldn't find versions as simple and spectacular as Chef Celeste's. I remember it being served in nothing more than a basic pomodoro, which seemed heaven sent, as did everything else I tasted on the Il Giardino menu. The following year, Celeste and his friend Marco Gabrielli opened the original Michelangelo restaurant in Sugar House. They set the bar high for authentic Italian cuisine in Utah—Tuscan, in particular—and Michelangelo was an instant hit. But due to his mother's illness, Celeste sold Michelangelo in 2004 and returned to Italy with Gabrielli to open a restaurant in Versilia (Celeste is from the Versilia Beach area of northwestern Tuscany). That Paulo Celeste has now returned to Salt Lake City, and is running his own restaurant, makes me believe there is a God who watches over food lovers like me. I'm not going to be coy: His cooking is as wonderful as ever. You won't find better Italian fare in the region. The menu is set up in classic Italian style, with soups and salads, antipasti, pastas and secondi (meat and fish/seafood dishes). There's a small but adequate wine list, as well. 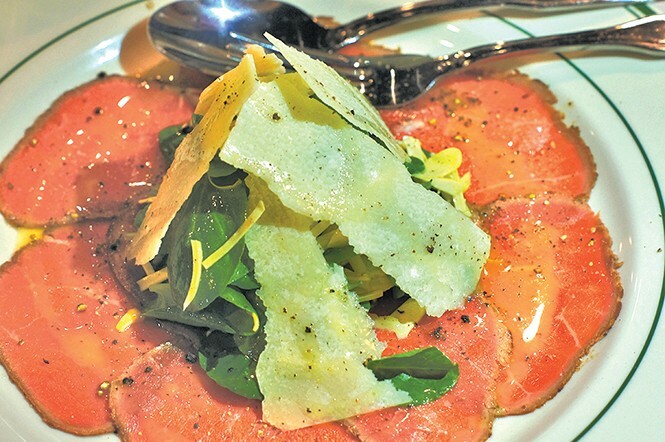 My favorite appetizer is the carpaccio di manzo ($12)—a generous serving of thinly sliced rounds of seared top sirloin topped with watercress, shreds of baby artichoke, shaved Parmigiano-Reggiano and a simple dressing of extra virgin olive oil and lemon. How Celeste manages to perfectly sear the meat while still retaining the rich, red rawness inside is a mystery to me. All I know is it's delicious. Following the carpaccio, my wife and I shared an order of gnocchi al granchio ($20), which is the chef's light-and-airy gnocchi in a silky pink tomato-cream sauce with lump crab meat. It's more complex than his simpler pomodoro—which now is served with penne—and easily qualifies as the most memorable gnocchi dish I've ever enjoyed. Items like fettuccine Bolognese ($18), trofie portofino ($20) and ravioli incavolati—fresh ravioli stuffed with kale and ricotta in a butter-sage sauce ($18)—all feature pasta made in-house. Even the bread served with the restaurant's own brand of EVOO and balsamic is home-baked; Celeste makes fresh bread and pasta during the day, which is why the eatery isn't open for lunch. Celeste learned to cook from his grandmother, who worked at a restaurant in Forte dei Marmi, and the resulting food and flavors are complex, but not complicated or convoluted—no foams, no molecular gastronomic trickery, no gimmicks. His cooking is honest and straightforward, using the best ingredients and letting them speak for themselves. Such is the case with his cernia alle olive ($26): perfectly steamed grouper in a light Tuscan olive sauce with lemon dressing, roasted potatoes and Brussels sprouts. Likewise, tagliata alla rucola ($25) is a large serving of grilled and sliced New York steak with nothing more than an olive oil and lemon dressing to enhance the flavor of the meat. It comes with arugula and grape tomatoes topped with shaved Parmesan and is extraordinary in its simplicity. I might not make it to Italy anytime soon, but with Paolo Celeste behind the stove again in SLC, at least I can eat like an Italian. Inside Saffron Valley's new Sugar House location.